Smooth muscle tumours arising in scrotum are specific and rare group of cutaneous tumours. In this report we document a case of atypical leiomyoma of scrotum, a rare tumour at this location. A 64-year-old male presented with a painless scrotal swelling of 6 months. The swelling was insidious in onset with no sudden increase in size. There were no aggravating or relieving factors and there was no history of fever/trauma. On local examination, a pedunclated non-tender, firm, circumscribed swelling was noted on the anterior surface of the scrotum measuring 4 × 4 × 2 cm in size. The lesion was not fixed to the skin or adjacent deeper tissues. There was no warmth or discharge noted. Testes on both sides were normal on palpation with no inguinal lymphadenoathy. A clinical diagnosis of fibroma was made and an excision biopsy was performed under local field block and sent for histopathological examination. On gross inspection, a polypoidal, skin-covered soft tissue was seen. The cut section showed a firm, grey-white solid lesion measuring 4 × 3.5 × 2.5 cm [Figure 1]. The histopathological examination revealed a well-circumscribed tumour composed of spindle-shaped cells localized to the dermis [Figure 2]a. Tumour cells were arranged in fascicles and interlacing bundles [Figure 2]b. Cells showed elongated vesicular nuclei with blunt ends and a moderate amount of eosinophilc cytoplasm. Many of the cells appeared bizarre with nuclear pleomorphism and hyperchromasia [Figure 2]c and [Figure 3] and a brisk mitotic activity was also noted (4/10 high-power field; [Figure 2]d). The surgical soft tissue margin was free of tumour. 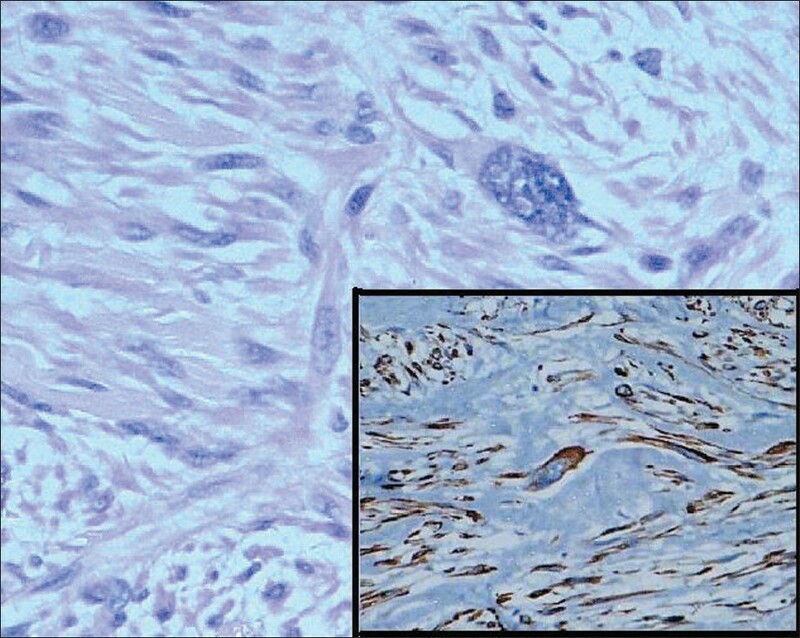 By immunohistochemistry, the tumour cells were found positive for desmin [[Figure 3] inset] and smooth muscle actin. The immunostain for S100 protein was non-specifically positive only in the cytoplasm of cells. A final histopathological diagnosis of atypical leiomyoma was rendered. Scrotal smooth muscle tumours originate from the subcutaneous tissue or tunica dartos and are extremely rare neoplasms. Scrotal smooth muscle tumours can further be categorized as leiomyoma, atypical leiomyoma and leiomyosarcoma. They usually present between the fourth and sixth decades of life and clinically appear as a circumscribed swelling or pedunclated scrotal mass. They are usually painless in nature; however, pain and hydrocele may be an associated feature. , Due to its painless and slow growing nature, the patient may recognize it late. Clinically, the differential diagnosis includes a sebaceous cyst, fibroma and, if painful, a schwannoma. Four pathological features are used to grade the vulval and scrotal smooth muscle tumours that include (i) size ≥5 cm in greatest dimension; (ii) infiltrating margin; (iii) ≥5 mitotic figures per 10 high-power field and (iv) moderate cytological atypia. Tumours with only one of the above-mentioned features are considered benign and those fulfilling two of the criteria are diagnosed as atypical leiomyomas while tumours showing three to four of these criteria are leiomyosarcomas. Special histochemical stains like Masson's trichrome can add information by demonstrating the myogenic nature of the tumour. Immunohistochemistry plays a vital role in determining the nature of spindle cells and conferring a final diagnosis. The smooth muscle tumour shows cytoplasmic positivity for smooth muscle actin and desmin and is negative for S100 protein. Conventional leiomyomas and atypical leiomyomas behave in a similar fashion. Hence, they are conservatively managed with just an excision while leiomyosarcomas require a wider resection with a 3 to 5 cm margin, including the subcutaneous tissue and fascia and negative margins. Previous reported cases on cutaneous atypical leiomyomas documented no recurrence or metastasis on a short follow-up period of 5 years. As the number of reported cases is less and the follow-up period is short, a close clinical surveillance of patients with an atypical leiomyoma is essential. 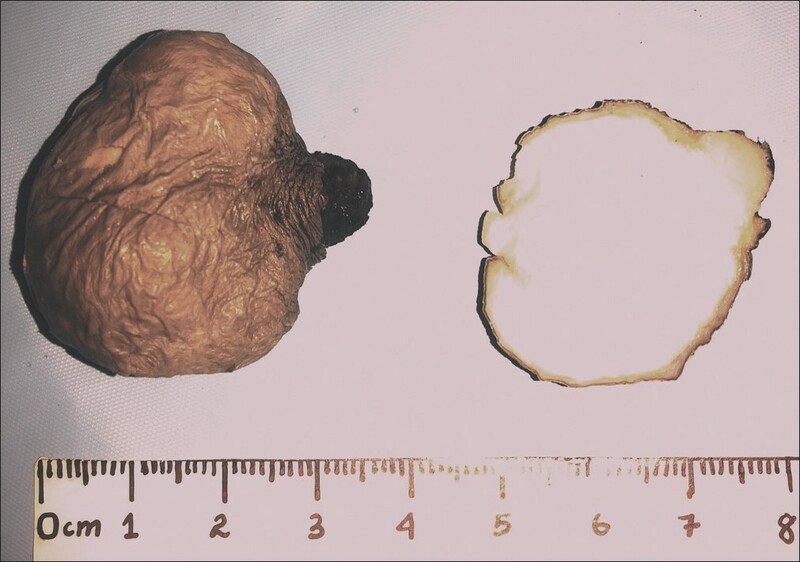 This case presentation highlights the fact that pathologists and clinicians should be aware of the occurrence of this rare entity of atypical scrotal leiomyomas. This should be distinguished from a leiomyosarcoma in order to avoid an over-diagnosis leading to a radical surgery. 1. Kim NR, Sung CD, Han J. Bizarre leiomyoma of scrotum. J Korean Med Sci 2003;18:452-4. 2. Das AK, Bolick Dr., Little NA, walther PJ. Pedunclated scrotal mass: Leiomyoma of scrotum. Urology 1992;39:376-9. 3. Khoubehi B, Mishra V, Ali M, Motiwala H, Karim O. Adult paratesticular tumours. BJU Int 2002;90:707-15. 5. Newman Pl, Fletcher CD. 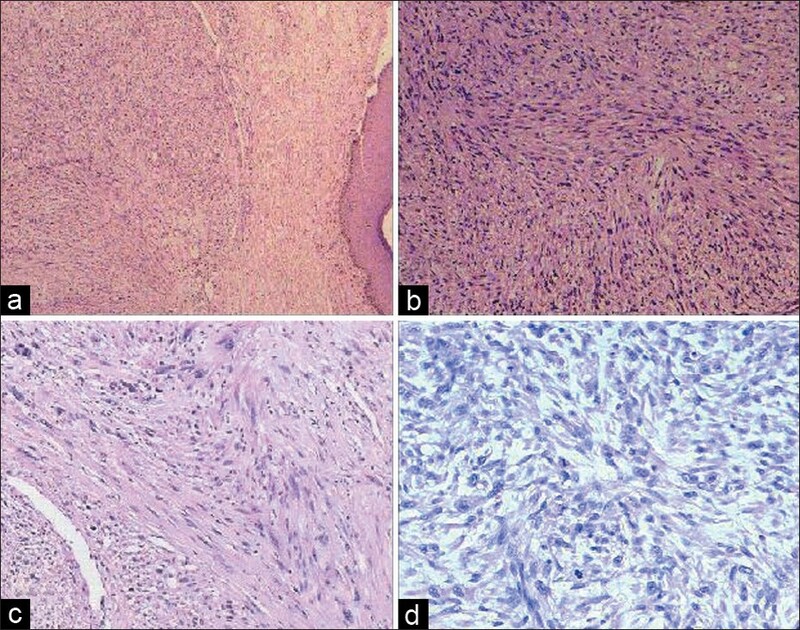 Smooth muscle tumours of the external genitalia: Clinicopathology analysis of series. Histopathology 1991;18:523-9.